Fourth Row Center: Film Writings by Jason Bailey: On DVD: "A River Runs Through It"
"In our family, there was no clear line between religion and fly fishing." Robert Redford puts those words right at the beginning of A River Runs Through It; the director narrates the film in earnest, reverential tones, his text frequently lifted verbatim from the Norman Maclean novella that inspired it. His considerable charisma (even only as a voice-over actor) lends weight to the film; unfortunately, his workmanlike but uninspired direction doesn’t. As with much of his directorial filmography, Redford knows how to shoot a pretty picture, but not how to give that picture a pulse. 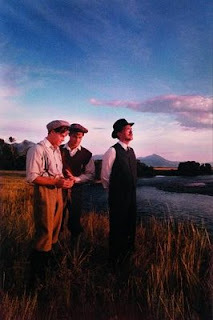 The film tells the story of Norman (played by Joseph Gordon-Levitt as a child and Craig Sheffer as an adult), the son of a Presbyterian preacher who comes of age in Missoula, Montana, where he is taught the value of religion, hard work, and fly fishing. His younger brother Paul (Vann Gravage as a child; Brad Pitt as an adult) becomes something of a rebel (at least for Montana); he takes up with Indian women, drinks and brawls too much, and gambles to a fault. The film spends its first quarter or so with the boys as they grow up; the bulk of the film takes place after Norman has returned home from college, where he attempts to reconnect with his wandering brother while falling in love with Jessie Burns (Emily Lloyd), a local girl who is the apple of his eye. In terms of plot, there’s not a lot to be found in A River Runs Through It; as with many pieces of short fiction, it is more about mood and character, time and place. But Redford (and screenwriter Richard Friedenberg) lean too heavily on the voice-overs, and they never really manage to find a narrative engine for the film; it’s pleasant to watch, but there’s never much at stake, even when Paul starts running up debts he can’t pay back. We’re told that Paul is danger more than we’re shown it (except for some cheerful drinking, his transgressions are kept safely off-screen), and even when the story strands should be pulled taut, Redford continues to wander from scene to scene, seemingly with all the time in the world to spare. The closest thing they can muster up to an antagonist is Jessie’s smarmy brother Neal (Stephen Shellen), and the subtlety of his characterization can be best summed up by his first scene, in which he appears with a sweater tied over his shoulders. The same kind of broad brush paints the rest of his screen time, though admittedly, the appearance of this “world-class peckerwood” does give the film a mild (but needed) jolt of energy. The performances are interesting. Watching the film this long after its release, one can’t help but feel that Redford cast it incorrectly; both young actors appear to be playing the wrong role. Sheffer (who is, admittedly, an actor I’ve never cottoned to) seems too smug for innocent, wide-eyed Norman—there’s a darkness to his on-screen nature, and you catch him faking his kindness, stifling his more interesting impulses. Pitt, on the other hand, would seem a perfect fit for golden boy Norman; I’ve long been an admirer of his work, but he couldn’t quite hit the right self-destructive marks (at least, not at this point in his career). Through most of the film, he seems to think he can convey Paul’s devil-may-care attitude with a wide but empty grin. Tom Skerritt and Brenda Blethyn are strong but underused as the boys’ parents; Emily Lloyd (who, for a brief time in the early 90s, was to be the Next Big Thing) does her best with her bland role, though her American accent is a little shaky. Casting reservations aside, there is some fine acting in the closing sequences, even if the prose of the narration (while admittedly beautiful) is doing too much of the heavy lifting. When you come right down to it, it’s not there’s anything exactly wrong with A River Runs Through It. But there’s also not a helluva lot to it, either. It is cinematic comfort food—a film of pleasant chuckles and lovely photography and longing for a bygone era, and you can safely watch with your older relatives and not worry about offending anybody. It’s beautifully made, right down to the required sepia-toned flashbacks images at the end. But it’s a museum piece—there’s not much in it that’s living and breathing. "A River Runs Through It" makes its Blu-ray debut on Tuesday, July 28th.